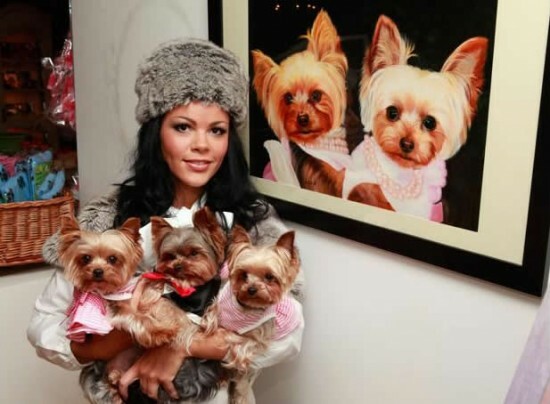 31-year-old Louise Harris has to be one of the craziest dog owners in the world, having spent over $160,000 in the last six years, buying jewelry and accessories for her three pets. “A lot of people think I’m mad, and I realize it’s completely over the top, but I want to give them the best life I possibly can” says Ms. Harris, who would do practically anything to make her three Yorkshire terriers happy. Six years ago, she fell in love with tiny Lola, who could fit in the palm of her hand, ans immediately started ordering collars and clothing items for her. Since the ones she found in the UK weren’t very comfortable, she started ordering from the United States, and before she realized it, she had bought a whole wardrobe for her beloved dog. Two years later she bough Lulu, and in 2008 she got Larry, and spared no expense in feeling them like royalty. The spoiled trio only wear collars and tiaras studded with rubies, emeralds and Swarovski crystals, as well as the latest designer accessories, and receive weekly massages and deep coat conditioning treatments. The dogs sleep in a $in a $3,200 four-poster bed and are featured in a commissioned oil painting that cost $8,000. Oh, and last Christmas they received $6,500 worth of presents. Single Louise Harris says her dogs come first and that any of her future partners must understand that, if they want the relationship to work. Dogs can’t cook their own breakfast or get dressed, so she has to be there for them. 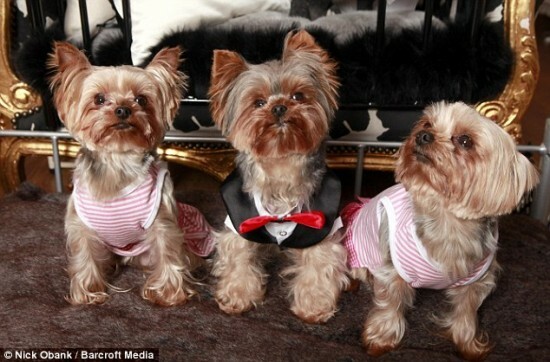 Although Lola, Lulu and Larry cost her a small fortune, so far, they were also the inspiration of her successful business – Diva Dogs – a boutique offering luxury dog accessories with clients that include television presenters and football player wives.